The Third Party Inspection for power transformer article provides a sample procedure /instruction for power transformer testing and inspection in manufacturing shop. This article should be reviewed with power transformer inspection and test plan. This content guides you through all the necessary stages in the production of the power transformers, including the raw material, final inspection, preservation and packing, and dispatch to site. You need to take this point into account: this article is written for a typical power transformers and might not be detailed for special cases. 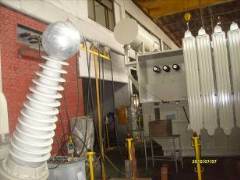 All power transformers inspection and testing is done against the approved drawings, purchase order specifications, purchasers or company standards, and within the practices and rules of the country, state or province and any government decrees, laws, ordinance or regulation as may apply. The applicable codes and standards may be based on any international standards. This content is general and can be useful for all recognized standards. The list of documents normally is agreed upon in the Pre-Inspection meeting, which is held several weeks before the actual commencement of the inspection work. The parties that participate in this meeting are the manufacturer, purchaser and third party inspection agency representatives. 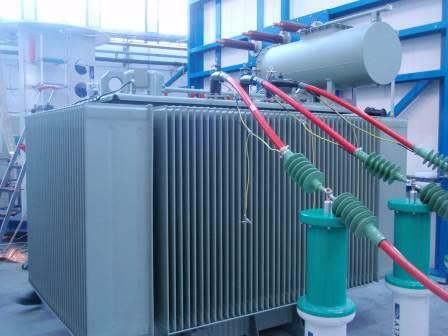 The first actual inspection work in the power transformers is the materials inspection. The original or authenticated copies of mill certificates of material normally are available at the manufacturer's premises. The third party inspector examines these certificates for compliance with specifications, and where appropriate, drawings. Ancillary items may be supported by test certification, or by certificates of conformity. It is necessary the content of certification to be appropriate to the required scope of the items. Instruments normally are supported by instrument calibration records. Then the inspector witnesses the materials identification on the certificates against the materials marking. It is also necessary to check these with the power transformers drawing datasheet, material list and other specifications as appropriate. Visual inspection for surface finish and probable defects is done and dimensional compliance with specification need to be controlled, as well. When the power transformers material inspection being carried out, and the results were satisfactory or non-conformities were closed by remedial action, then the power transformers manufacturer will start fabrication/ welding. The third party inspector checks the following points on the power transformers, based on the inspection and test plan (ITP), which has already been agreed upon between the purchaser and the power transformers manufacturer. This depends in the inspection budget, which purchasers assign for inspection. Much more inspection will have a much larger cost and less risk, and conversely, less inspection will have less cost but more risks. The inspection is done based of approved drawings. Resistance of all windings are measured, with winding temperature at recorded ambient, using a milliohmeter and acceptance criteria is power transformer datasheet. Primary to secondary winding ratios, for each phase, for all tappings are measured using a ratiometer and acceptance criteria is power transformer datasheet. The transformer is subjected to full load current at rated voltage (various loading methods may apply), with “normal” tap selected, with monitoring of oil temperature (lower and upper); cooling air temperature measured by at least 3 thermometers in liquid providing a time constant of 2H, placed at 1 to 2 metres from the cooling surface for “Air Natural” cooling (for “Air Forced” cooling, the thermometers should be within the air input flow, at 1 to 2 metres). Conditions are maintained until oil temperature stabilises (generally specified as less than 3°C rise in 1 hour). Where R1 is the cold resistance and R2 is the resistance, with cooling curve corrections applied, after switching off. Acceptance criterion is in according of applicable specification and datasheet. Shorting links are applied (either to the primaries or to the secondaries, dependant on test supply voltages). Voltage supply is applied to the opposing windings and increased until rated current is achieved. Input and output powers are measured and loss calculated. Rated voltage is applied to primaries or secondaries, with the opposing windings open circuit. Input and output powers are monitored and loss calculated. Efficiency is calculated from the losses. Third party inspector reviews the calculation in manufacture quality control records. There are three methods; dependent on winding category, the test would be acceptable if no collapse occurs in test voltage. Test requirements vary with winding category and acceptable level is in according to applicable standard. A single phase AC voltage of power frequency (not less than 80% of the rated frequency) is applied. Peak value is measured. The peak value x sq. rt.2 = test value. The voltage is gradually increased from 1/3 vale and sustained for 60 seconds. The test is applied between each winding and the terminals of all other windings, core, frame and tank, all connected together to earth. The test would be acceptable if no collapse occurs in the test voltage. Ancillaries normally include “Buchholz” oil pressure protection, temperature monitoring devises and ancillary wiring. These are checked as conforming to drawings. Wiring is subjected to insulation test, where appropriate and withstand test, where appropriate. The third party inspector provides an Inspection Visit Report (IVR) after each visit, as well as a final report summarizing the activities carried out during the power transformer production in accordance with the contract requirements and circulated within the time limits specified in the contract. The report is in the format required by the client and clearly indicates final acceptance or rejection of the power transformer. When required by the contract or purchase order, a release note is issued by the third party inspection agency and given to the manufacturer when the power transformers have been accepted. Verify that the packing materials conform to specifications and accepted practice for the mode of transport. Verify shipping marks to marking instructions and record.